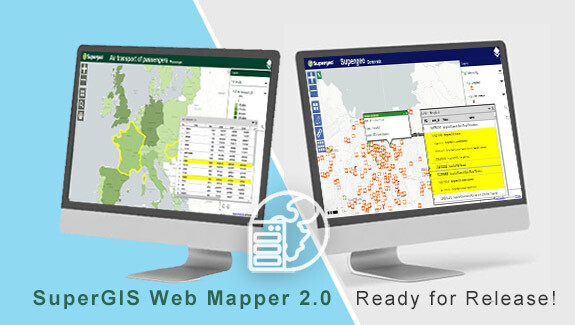 You are here: Home / * PRESS / Software / SuperGIS Web Mapper 2.0 Is Ready for Release! Supergeo Technologies Inc. is excited to announce the release of upgraded SuperGIS Web Mapper! This primary new feature of SuperGIS Server 10 will help users create highly customized GIS websites effortlessly. Designed to minimize the time-consuming work on layout design, SuperGIS Web Mapper is a powerful toolbox for users to rapidly build up a custom GIS website without a single line of code. When using this function, people can find and add the GIS tools they need to the website within few mouse clicks. Many useful widgets are provided for quick selection, such as Identify, Index Map, Query, Measure, Print, Draw Tool, Basemap, etc. Moreover, this update inherits the outstanding features from SuperGIS Server 3.3, such as no limitation on the data size and the number of access, which will also significantly assist system architects to plan and deploy their web resources but keeping the budget competitive at the same time. Besides, SuperGIS Server enables users to connect to the Android Mobile GIS app, SuperSurv 10, which has further increased the feasibility of real-time spatial data collection and display. The updated version of SuperGIS Web Mapper will shortly be released in Q2, 2018. Please feel free to check the following demo video or write to staff@supergeotek.com for a full-function free trial. Customize your GIS platform easily with Python!